This listing includes onlyone Magic Blood Powder. 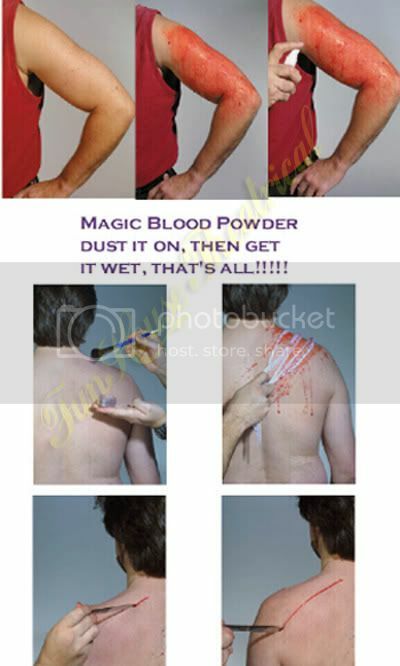 This Magic Blood Powder is a water activated powder that when applied is invisible, but when sprayed with water, it looks likeroad rash from a motorcycle accident. It also creates a whipping and slashing effect as well. Magic Blood Powder is a big hit with the EMS people! Note: A few tablespoons to a gallon of water will yield a very economical splashing blood. Effects made with Magic Blood Powder wash off easily with ordinary bar soap and water.